Pancalen Cycles: Mumu's Surly Long Haul Trucker 26"
Mumu's Surly Long Haul Trucker 26"
As a bicycle touring enthusiast, Mumu wanted a replacement for his old 27" steel steed. Something with easier access to spare tires and tubes wherever he goes. 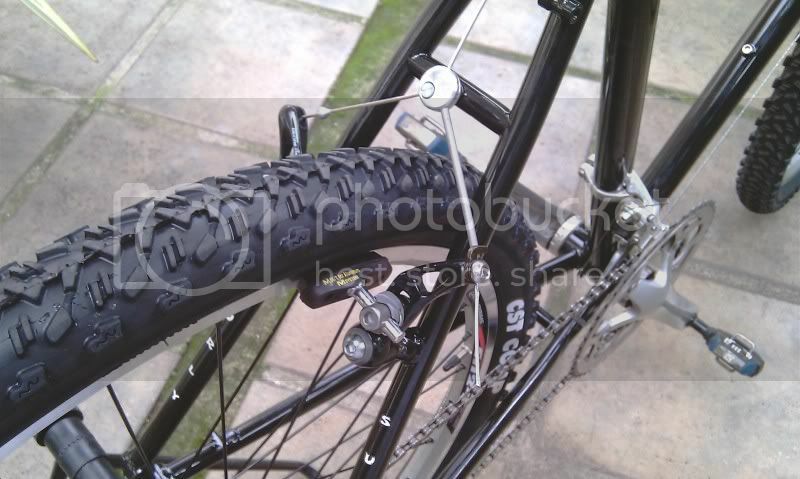 Something with a load of braze-ons to install racks, cages and even spare spokes. Enter the Long Haul Trucker. A frame truly built for long haul touring. 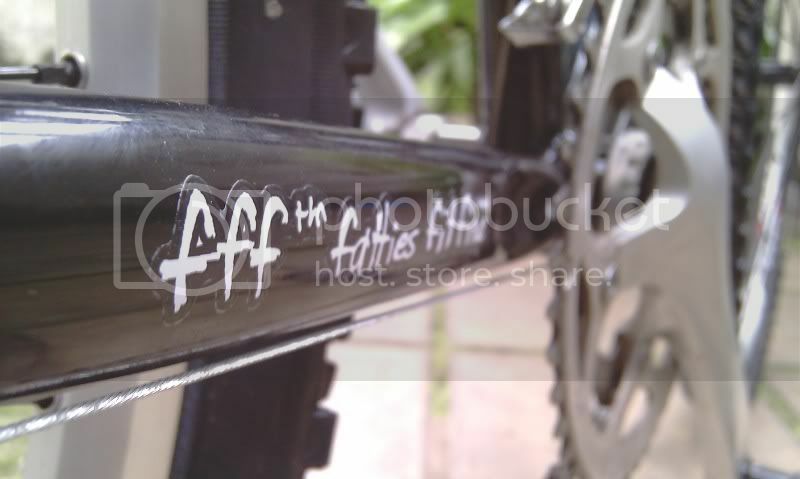 Long wheelbase, low bottom bracket height, and 26" tires since you can source them from anywhere in the world, a lot easier than 700c tires. The drivetrain is Shimano all over. 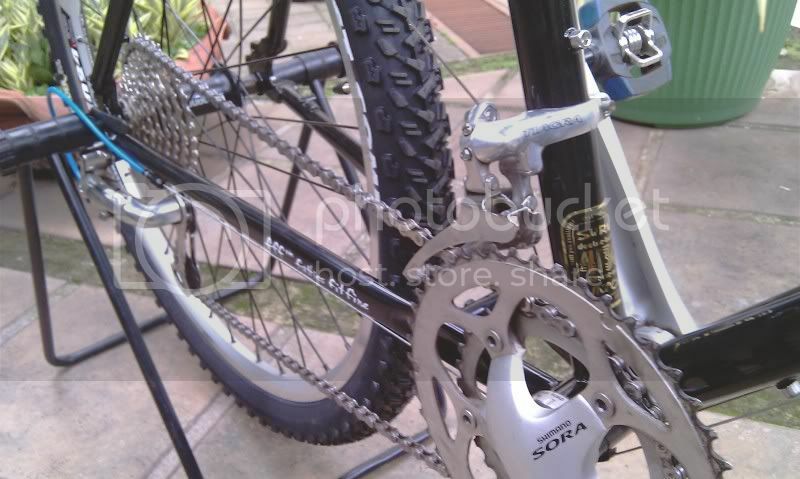 Sora crankset with external bottom bracket bearing, Tiagra front derailer, 105 medium cage rear derailer, CS-HG30-9 11-32T 9-speed cassette, CN-HG93 chain. For touring usage, drop bars are preferred because of several hand position it provides. The stem is set high so we can level the Truvativ drop bar with the WTB Rocket V saddle we used here. This is intended to reduce fatigue, we should have used a stem with more rise angle. 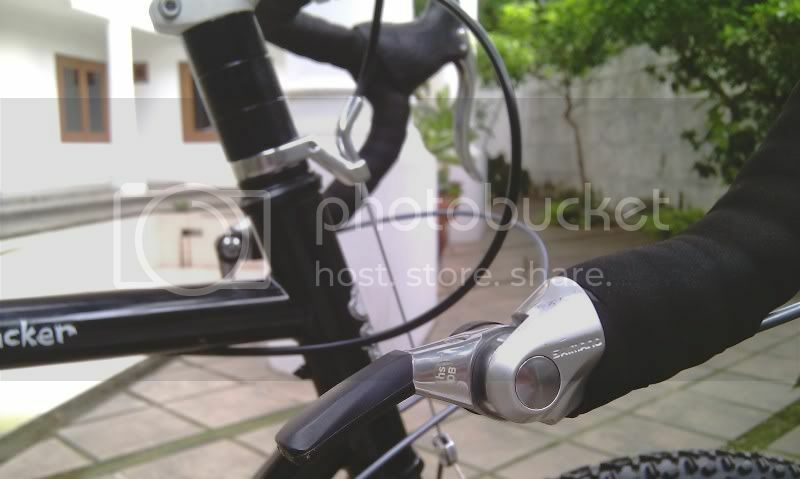 To use drop bars, you can choose between separated shifter and brake levers or integrated ones, such as Shimano's STI or Campagnolo's Ergo levers. To make things easier and cheaper to replace when broken, Mumu decided to go with the separated option, Cane Creek SCR-5 aero brake levers accompanied by Shimano Dura Ace bar end shfters. The shifters are set to the friction mode, since its 10-speed index doesn't match the 9-speed rear cassette. At least for now, since he had a plan to switch to Shimano SLX 10-speed cassette. Here you can see one of many interesting design feature on the Long Haul Trucker frame, an offset headtube protruding from the toptube intended to provide upright riding position without having to stack a lot of spacers under the stem. If you use conventional aero brake levers, cantilever brakes are the only rim brakes to go aside from dual pivot caliper brakes or special short-arm V-brakes. Conventional V-brakes just won't work with conventional aero levers, mainly because of the difference on the cable pull ratio between them. We used a set of classic yet proven Shimano LX cantilevers on this bike. The setup might be a little fuss, but once you do it properly, it performs flawlessly. 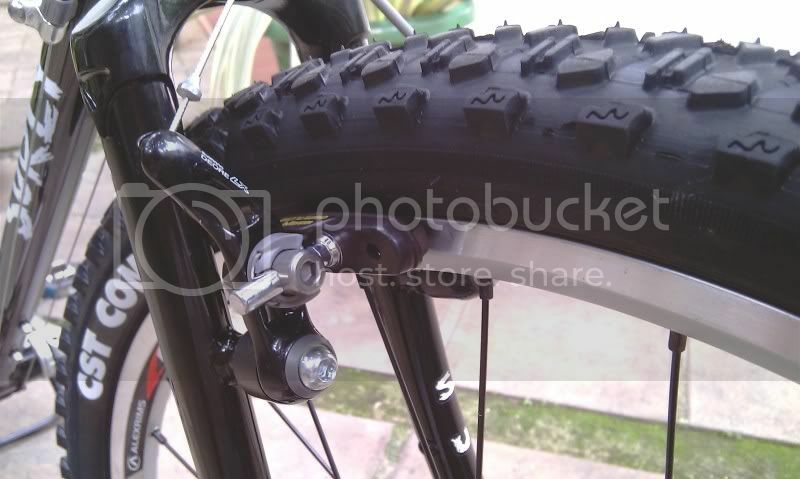 The wheels are Alex Rims EN24 laced to a Shimano FH-M470 freehub and a Formula front hub, shod with CST Crusader 26x1,95. 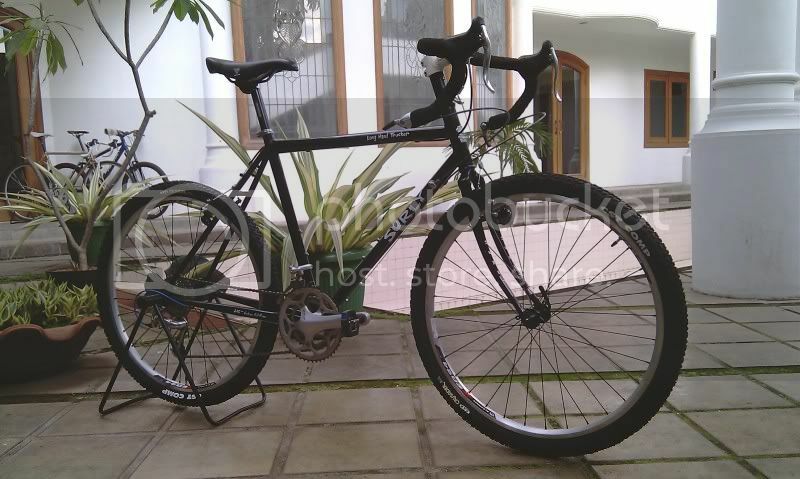 Mumu is going to take this bike for a test ride to Bogor before another trip to Bandung real soon. Looking forward to hear from you, buddy! wew.. i cant believe i just read more than 2 years ..., whe i visit rangga for my next roadbike assembly.., when he told me i was his first customer as a pro bike mechanic..., i will sent a link my latest setup with slicker tire, brooks saddle, and rear rack for touring and commuting..